Strange Glory explores the manifold expression of human nature through the relatively short life of the twentieth century theologian, Dietrich Bonhoeffer. Marsh does an excellent job in retelling the story of this provocative mind, adding insightful details that others understandably glossed over. 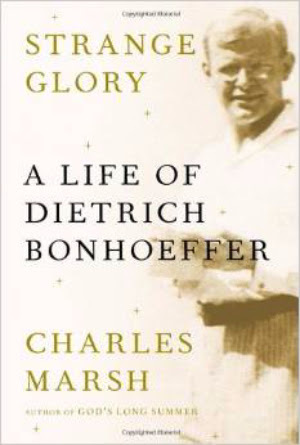 Bonhoeffer lived, at least from one perspective, an enviably charmed life. He was born into privilege, born with a gifted mind, yet also born with an unusual drive to explore spirituality. Sadly, both privilege and giftedness also served as distractions and even as obstacles to his emotional maturation. The result was that Bonhoeffer’s life was one of constant war, fighting battles on several different fronts simultaneously. At any given time he was at once wrestling with his theology, his church, his culture, his politics, and well as his sense of self. The reader is reminded that man can function like a beast or as a saint, depending on his willingness to apply his power to choose. The choosing can be a tortuous process, if one is willing to become as fully informed as possible and determined to wrestle with the options until a clear path is made evident. Bonhoeffer was unwilling to run from the issues that faced him and resisted inclinations to slavishly react to circumstances. He chose to be a thinker rather than a mere lazy follower of other men’s thoughts. The context within which Bonhoeffer lived added another layer to his decision making. Though he, and we, would have preferred it was otherwise, the choices we are given are not always between something good and something bad. Often, we can only choose between bad and a little less bad, or as Marsh nicely explained, between bold sin or the sin of neglect. Bonhoeffer chose not to run from the issues of his day, abandoning them for others to solve. Yet by engaging his reality he was torn between two seemingly contradictory commands given by Christ. On the one hand Jesus calls us to release those who are oppressed, yet on the other hand to love one’s enemy. To disobey either was ‘sin’, yet as Bonhoeffer concluded, sometimes ‘sin’ is the only option available, which only grace allows for. So, what does a follower of Christ do when confronted with the evils perpetrated by the likes of Hitler? Are we called to love the Hitlers of life even though they continue to destroy thousands and even millions of innocent lives, or do we so hate the evil of folks like Hitler that we are willing to participate in any mission to stop him – even if that includes his assassination? It is ‘sin’ not to rescue those who are being oppressed, yet it is also sin to murder the perpetrator of oppression. In the setting of his times, Bonhoeffer discovered that his theology was only useful if it worked in real life, not simply within the four safe walls of a cathedral. Following the Jesus of scripture, Bonhoeffer had been lead into pacifism. Yet, overlaying his theological conclusion was the reality of the 1940’s German regime, which inclined Bonhoeffer to set aside his pacifism – at least in this particular case. In other words, his choice to become part of an assassination plot did not mean that he had decided to cast out morality in all circumstances. With excruciating effort he concluded that ‘sin’ was morally acceptable in rate cases. Few wrestle as intensely with these issues as did Pastor Bonhoeffer. Most folks either run from stress-inducing issues or mindlessly react to them. Marsh, in this volume, invites each reader to rethink what it means to follow Jesus. There is no downside to that, since the end result is a matured faith.